There’s no doubt that zinc is currently the most attractive base metal investment out there – It’s almost a fairytale story. 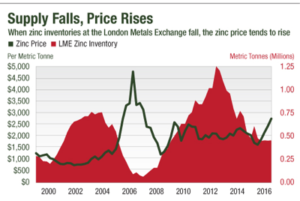 The natural resource sector is based on the most fundamental economic equation, supply and demand, and zinc is following a classic pattern that is truly the quintessential formation of a once-in-a-generation bull market. As seen in the chart, 2016 is proving to be a year in which we will see a severe supply deficit, and it will carry on into 2017. In 2016, zinc is the top-performing metal, and the reason is simple: stockpiles are ultra-low and two major mines have shut down. China is the biggest driver of demand for zinc. It consumes close to 50% of the world’s supply. The astounding mega-projects that include bridges that will connect hundreds of millions of people, the cities that will house 20M-50M citizens, and the train system that aims to connect to Turkey – these require an unbelievable amount of zinc. 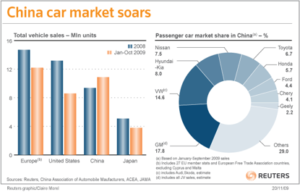 Only about a third of Chinese-manufactured automobiles use galvanised panels to prevent corrosion and rusting. Switching to the material would require about 350,000 metric tons a year of additional zinc. This metal is the anti-corrosion fighter. About 50% of all zinc is processed and applied as a coating to iron and steel to prevent rust. The problem is that between 2008 and 2015, the bleak outlook for the global economy made zinc prices very cheap, and supply disappeared. 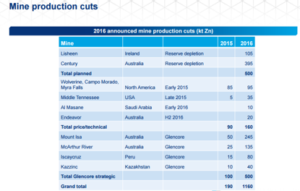 Two major mines were depleted and closed down last year: Australia’s Century mine and Ireland’s Lisheen mine. Their joint production capability was 630,000 tons annually. Stockpiles are also severely diminishing. Zinc consumption has grown steadily over the past decade from about 11 million tons in 2005 to 13.8 million tons in 2015. That works out to about 2.8% per year. 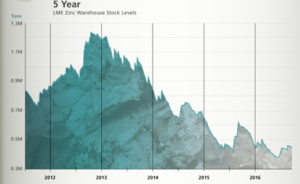 Zinc recently bottomed out at $0.66 per pound in December 2015, and it has rallied since then. Here’s the key to understanding resource bull markets: current exploration funding and near-term new producers – that’s how an investor can gaze into the supply and demand dynamics going forward. Right now, I can tell you that they’re virtually nonexistent! Only a handful of projects will come online in the next few years, and none of them will make a material difference. Companies that have producing mines have enjoyed the rally, and so the key for Wealth Research Group has been to seek and find the most undervalued company in the entire sector that comes with the highest degree of safety and financial strength. What we did was go after companies that are now only forming, examining their projects so we can be the first to partner up with the future mega-discoveries in the sector, and for the past 60 days, I have looked at every single company. Suffice it to say that Wealth Research Group has found what could be the mother lode, and I will make sure you have all the details before any other investor once we complete our final stage of due-diligence. 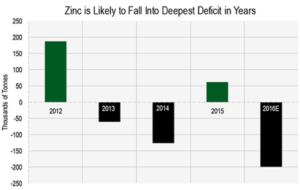 Make sure to become fully educated on the zinc market until then with this exclusive report. We aren’t just focusing on zinc – our team is conducting comprehensive research into uranium at the moment. Mark my words; the uranium price has become so low that the downside risk is close to zero. Now, the best plan of action is to create a watch list of the best companies and wait for the ideal moment. 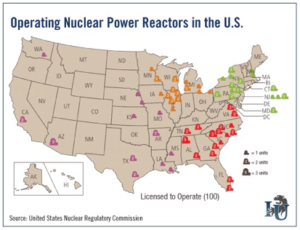 Again, the focus is China, which understands that its energy independence is entirely a question of uranium. The superpower can’t afford to be dependent on foreign oil, and so it is building new power plants fueled by uranium. And in the U.S., it seems very likely that Donald Trump as president means good news for uranium investors. I want to make sure you are ready and prepared for the uranium bull market, because the bear market has been the worst ever, and it means that as contrarians, we should be taking every step to lock in early positions. Take the time to learn about the world of uranium and its main players and characteristics today with the exclusive report our team has put together, because no one is covering this, and that’s why I am genuinely confident that the bottom is close.